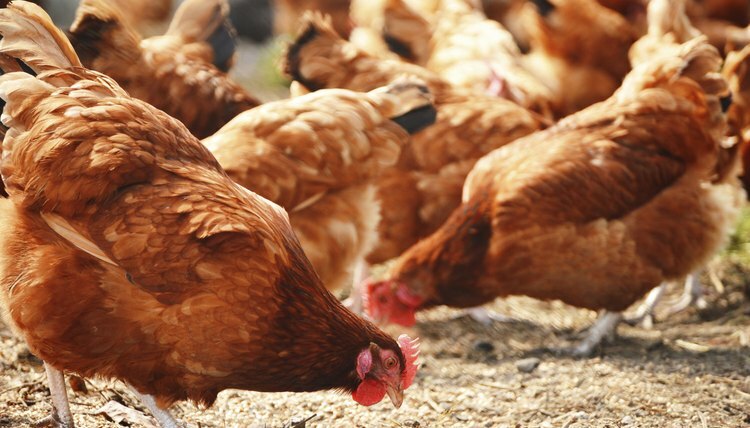 Chicken breeds fall into three basic categories -- egg producers, meat birds and dual-purpose types. Broilers, in the second category, have been engineered to mature quickly, ready to market as early as 6 weeks of age. The commercial market depends on just a few broiler breeds or types. These birds don't make good pets if you're not in the market for meat. They're not bred for longevity, and size creates issues in older birds. The most common type of broiler isn't an actual breed but is a cross of the white rock and Cornish chickens. Male Cornish/white rock crosses weigh about 4.5 pounds by the age of 6 weeks. If kept around five weeks longer, they weigh in at about 9.5 pounds. Females of this cross, known as Cornish game hens, grow more slowly, weighing approximately 2.5 pounds at 5 weeks old. Like other white-feathered meat birds, their carcasses don't have discolored areas on the skin because of feather growth. Red broilers, or Label Rouge, don't mature as fast as the Cornish crosses. It takes them twice as long -- 12 weeks -- to reach market size. Males mature at about 7 pounds and females at 5 pounds. If you want to raise broilers outdoors instead of in an indoor facility, red broilers make a good choice. As their name implies, these birds have feathering of various shades of red, and some have dark tails. Hens produce large brown eggs but won't go broody. That means you must incubate the fertilized eggs if you want to raise another red broiler generation. Developed in the 1940s, Delaware chickens resulted from crossing Rhode Island Red hens with Barred Plymouth Rock roosters. At one time, Delawares were widely used in the broiler industry, but the Livestock Conservancy -- which monitors rare breeds -- now lists them as threatened. The Delawares' white bodies sport black barring on their necks and tails. Males mature early, tipping the scales at 8 pounds; hens are smaller at 6 pounds. Unlike some other broiler breeds, Delawares are also useful for small-scale egg production. Other breeds or types of broiler chickens are generally Cornish crosses. You can find these chicks for sale in large-scale hatcheries across the country. A relatively new breed is the Rosambro, a chicken resembling a red broiler with faster growth. Expect a Rosambro to mature between the ages of 8 to 10 weeks. Other common meat breeds don't grow as quickly as broilers.